Russian President Vladimir Putin told Venezuelan President Nicolás Maduro that their countries must team up to shore up oil prices, a spokesman for the Kremlin said, Reuters reported Thursday. Both leaders were in Beijing to attend a military parade marking the 70th anniversary of Japan's surrender at the end of World War II. The price of a barrel of oil has dropped by half since June 2014 and continues to hover at about half the average price from the past 10 years. On Thursday, Brent crude oil was trading for roughly $51 per barrel. Both leaders have indicated that they agreed it was important to stabilize oil prices, but tactics for achieving such a goal remain unclear. 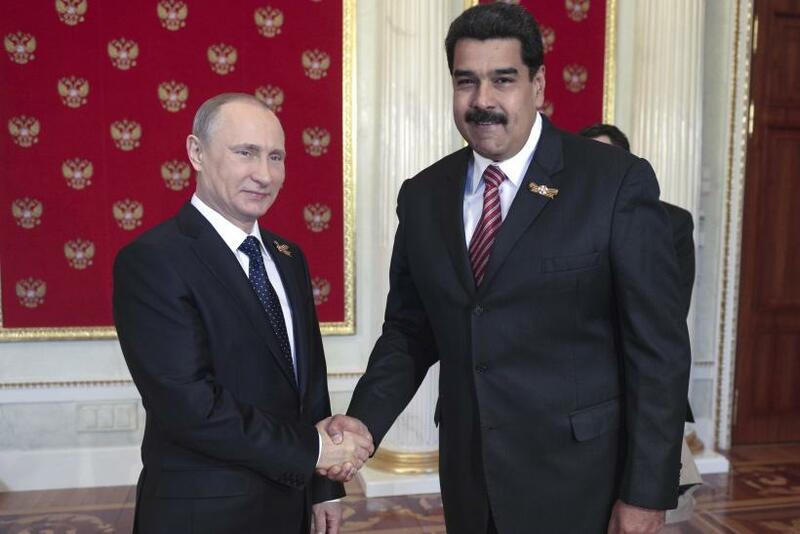 While in Beijing, Maduro said he and Putin would discuss strategies for stabilizing oil prices. "We can talk about what we can do to stabilize oil market and stabilize prices, what would allow us to overcome the current conditions," Maduro told Putin as they began their meeting, Reuters reported. "We have some not bad ideas on this issue," he added. But prior to their meeting, a Russian source told Reuters that their discussion was not expected to produce any tangible results. Both Venezuela and Russia's economies depend on oil, but to date Moscow has refused to cut production in order to bolster global prices. Falling prices have also sparked concerns among the Organization of the Petroleum Exporting Countries, or OPEC, which in its latest bulletin said, "Today's continuing pressure on prices, brought about by higher crude production, coupled with market speculation, remains a cause for concern for OPEC and its members -- indeed for all stakeholders in the industry." Venezuela is one of the founding members of OPEC. Russia is not a member of the organization at all, but as a major global oil producer, its output influences the market considerably. "Both Russia and OPEC have been impacted by the market instability and price volatility that we have seen in recent quarters," Abdalla Salem El-Badri, OPEC's secretary general said in the bulletin. "This includes a general market oversupply — with rising oil stocks in an environment of global economic uncertainties — and of course, the lower price environment."